Having ministered at St Mary’s for over a decade, it is a joy to know and be part of this great community. My passion is seeing people discover the amazing person Jesus is, and the transforming work the Holy Spirit brings in our lives all the time! I still speak with an accent (so I’m told! ); I am married to the lovely Julie; we have an awesome daughter Sarah…and a dog called Millie! I also love good wine (anything New Zealand of course! ), Advert Stamps, and Viola jokes. After three years of training, I was ordained this summer and moved to sunny Eaton Socon. I am still amazed that I am allowed to live in such a beautiful place. I have two grown up children. Apart from spending time with them, some of the things which make me happy are being out in the fresh air and a good cup of coffee. God’s unfailing love has kept me going through good times and bad, so I want other people to know how much he loves and cares for them. There was a young man from Brentwood Whose Churchwardening was terribly good. He would work night and day and never ever receive pay. Oh that wonderful chap from Brentwood. I joined SMES in 2010 when my wife Barbara I moved into the area; we originally hail from ‘Glorious Essex’. We have two sons, Peter and Christopher and five grandchildren. As one of the Churchwardens I feel privileged to be involved in the running of SMES and I am passionate about seeing our church grow and the Lord’s work being done in our parish. My interests include: Cooking: I like to think that my guests are ‘never knowingly underfed; Fly fishing; Travel: Churchwardens need holidays! I am the Treasurer of the Church. For extra revenue I always search. I was born and bred in the city of Norwich. Brought up on enormous bowls of porridge. Got married and had four wonderful kids. They’re grown up now, I’ll take any bids! I enjoy what I do, I feel I belong. I wish I could sing, I like a good song. Now I’m retired I have time to give service. But don’t ask me to talk, that makes me nervous. 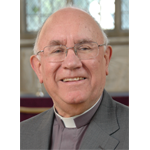 George is the latest addition to our clergy team. 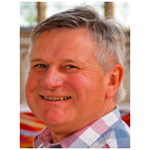 At the heart of George’s ministry has been evangelism and the healing ministry then later, palliative care chaplaincy. George has been very happily married to Marilyn since 1973, and they have two married sons and four wonderful grandchildren. As well as being a keep fit enthusiast George has been a longstanding supporter of Oxford United and Portsmouth FC, and Hampshire County Cricket Club. Other interests include reading, cryptic crosswords, and listening to music. Ray retired in 2013 from his full time role as a lecturer in World Mission, but evidence of retirement is hard to find. 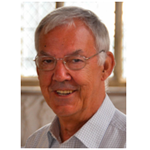 In addition to ministering at St Mary’s and neighbouring churches, and continuing to do some lecturing, Ray is involved in the Trustee bodies of several Christian organisations including OMF International. He is Chair of the Board of Global Connections that is a network of most UK Mission Agencies. His interest in trains is partially channelled through participating as a Trustee of the Railway Mission that provides Chaplains for the Railways. Ray and Janice have three grown up children and two grandchildren and live over the river in Eynesbury. I joined St Mary’s Church Eaton Socon in 2014 along my wife, Valerie. 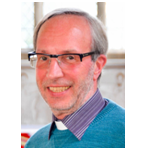 I started working as Tim’s PA in 2018, after having previously been Caretaker, Sexton and Verger at St Mary’s. I am currently studying a Theology degree part-time. I am passionate about making Jesus known and meeting people in our local community. My hobbies include listening to music, family history and American football. I joined the team at St Mary’s as Church Administrator at the end of 2016, after almost 30 years working for a well-known local company. I was drawn to the Church after serving the Food Bank which operates a centre at St Mary’s. I had been impressed with the community work I saw and wondered how I could help further. In that moment I decided to put in my CV – divine intervention one might say!! The rest is history. The post is varied and often very busy, but I love the work I do. I have been married to my best friend, Colin, for over 35 years and, no, I am not going to make any jokes about prison sentences being shorter!! I love cocker spaniels (I have two), gin and tonic, travelling, walking, reading and hassling the Vicar – and not necessarily in that order of importance!! Hi, my name is Roy and I am the caretaker. I started in the role in 2016 and have enjoyed supporting all the events this great old building holds. I moved to St Neots from Hertfordshire 11 years ago and like many people was immediately drawn to St Mary’s. Very soon after, I heard that the Church required a cleaner. I applied and without much fuss was accepted. I can often be seen wielding a toilet brush and battling with various vacuum cleaners! I have been married to Steve for 35 years and have two daughters, two gorgeous grandsons and care, full-time, for Molly. I feeI that I’ve become a part of the fabric of St Mary’s and very much enjoy my involvement in the Craft Group, Little Stars and the Food Bank.